Beef with Sauce, Spaghetti and Meatballs, and Beans and Wieners. 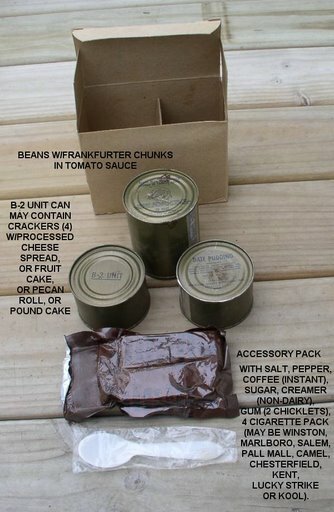 Using the words of our Quartermaster Corps - Each menu contains: one canned meat item; one canned fruit, bread or dessert item; one B unit; an accessory packet containing cigarettes, matches, chewing gum, toilet paper, coffee, cream, sugar, and salt; and a spoon. Although the meat item can be eaten cold, it is more palatable when heated. Pay attention to the last phrase - it is more palatable when heated. For some unknown reason, our Quartermaster friends never provided us with heating tablets. Combat troopers are ingenious improvisers when confronted with this sort of problem and this is how we solved it. For ambush operations and for securing our night defense, we made extensive use of Claymore anti-personnel mines that we could activate with an electrical firing device. Each mine contained 700 steel spheres and 1-1/2 pounds of composition C-4 explosive. Most combat troopers were highly trained experts at disassembling claymore mines and removing the C-4 explosives for cooking purposes. A small chunk of C-4 was all that was required to heat our meat item and make it more palatable. Whenever you mention C-Rations, you also have to mention McIlhenny’s Tabasco Pepper Sauce. 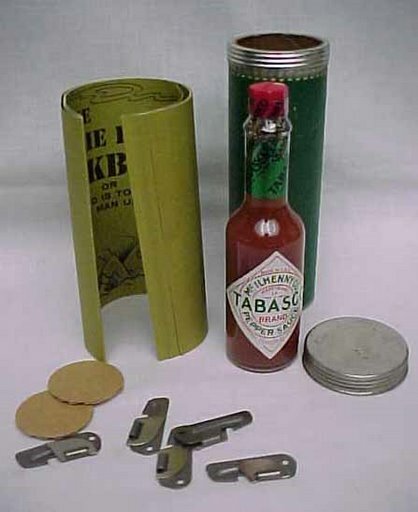 Even in the darkest regions of the Vietnam jungle, many combat troopers had their precious bottle of Tabasco Sauce along so that they could prepare a gourmet meal from their C-Rations. As a matter of fact, the McIlhenny Company prepared “The Charlie Ration Cookbook” especially for combat troopers in Vietnam. This cookbook contained numerous delicious recipes that could be used with C-Ration items together with, of course, a few drops of Tabasco Pepper Sauce. - I remember making pizza. 1 can of beef with spice sauce. 1 can of white bread, slice the bread in half.1 can of cheese. Spread the beef and then the cheese on the bread. Tabasco for seasoning. Bake in an ammo can, or at least long enough to melt the cheese. D.M. - Remember Russian cocoa? A full canteen cup with two or three coffees, a like number of creamers and sugars and one of the hot cocoa mix heated over some C-4. It sure tasted good when it got cold in the hills around the Ashau. Hawk. 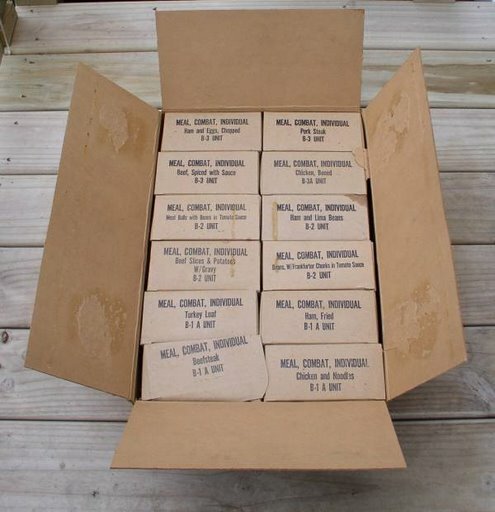 This is how we received a case of C-Rations containing 12 different meals. Here you can see all the items that came with the meal BEANS W/FRANKFURTER CHUNKS IN TOMATO SAUCE. Note: The Accessory Pack also contained toilet paper and a book of waterproof matches. Here is the famous Tabasco Sauce with a copy of the cookbook prepared for combat soldiers in Vietnam. The small metal gadgets are P-38 can openers. These were so important that we usually attached them to the chain that we wore around our neck with our Dog Tags. The RATION SUPPLEMENT SUNDRIES PACK was provided to troops who did not have access to a Post Exchange outlet. The Sundries Pack was a regular issue item to the troopers of Bravo Company and was considered as the "front line post exchange". It consists of a tobacco pack, a toilet article pack, and a confection pack to meet the requirements of 100 men for one day.